Visit iLandMan at Summer NAPE 2017 in booth #1616 to learn more about our powerful lease management software for the modern E&P. Verifies net-acreage by tracts and formations. Tracks lease expirations and extension payments. Schedules shut-in payments and drilling obligations. Monitors vertical and horizontal pugh clauses. Creates division orders and joint interest billing decks by unit, well, and depth. 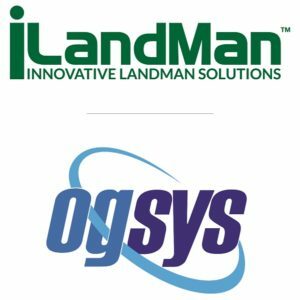 And don’t forget… iLandMan and OGsys have joined forces to create an integrated solution between the best in lease management and accounting software systems. This new relationship unites your land and accounting departments with more accurate and efficient processes than ever before by eliminating the duplication of data and reducing risk. Landmen, lease analysts, and finance teams now have access to single entries for addresses and payment information, and the power to automatically calculate divisions of interest and joint interest billing decks. If you would prefer to set up an appointment for a private demonstration in Houston, please call 1-855-445-9629 or fill out the form below.